Filipino Advocates for Justice | Ang Tao, Ang Bayan, Ngayon Ay Lumalaban!! The People United WILL NEVER Be Defeated!!! As we slowly recover from the shock of the Presidential election, we come together to share our fears, support each other, reject the racist, misogynistic, and xenophobic politics we just witnessed on a national scale and to assess what the immediate and long-term impact will be on our community. 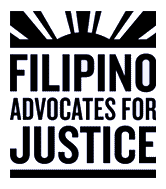 As Filipinos in the broader social justice movement, we stand in solidarity with communities the new Administration has promised to attack: immigrants, Muslims, Blacks, Latinos, native people, LGBTQ, women and disability communities. On day one President-elect Trump vows to: end DACA, cancel federal funding to Sanctuary Cities, begin deportation of 2 million supposed criminal illegal immigrants, and suspend immigration from terror-prone regions (which could be interpreted to include the Philippines). In his first 100 days Trump promises to end the Affordable Care Act, unravel policies aimed at slowing down global warming, deliver tax breaks to the wealthy, increase privatization, expand the existing wall on our border with Mexico, and so many more heartbreakingly dangerous policies. We have been here before. In response to a rise in anti-immigrant policies in the 1990’s including Republican Governor Pete Wilson’s infamous prop 187, Californians built a movement that challenged all anti-immigrant policies and eventually booted some of the worst anti-immigrant legislators out of office. It took a while, but today, CA has one of the most immigrant-sensitive legislatures in the country, many of who were involved in or inspired by the battles for immigrant rights of the 1990’s. Nationally, our country recently celebrated the 50th anniversary of people’s civil rights victories like the Voting Rights Act, the Civil Rights Act, the end of the bracero program and the Immigration and Nationality Act, to mention a few gains. We will power back from this seeming brink of disaster. Educate, organize, and build coalitions, between the disenfranchised and intersectional movements, across race, gender and generations. By resisting locally, we inspire resistance nationally. Focus on galvanizing young people, immigrants and low-wage workers in our movement building work. Show up in the streets, in the offices of legislators, and the voting booth. Register and use your vote in every election. The stakes are very high but we have faith that the social justice movement will fight back, recover from this setback and build the democracy we need. It might take a generation, but we are a resilient people who are part of a resilient movement. We will prevail guided by our Bayanihan values of social justice and human rights for all. Ang tao, ang bayan nayon ay lumalaban.